If you are travelling internationally, you need to plan ahead and make sure you have everything you need before you set off. Use this checklist to make sure you are well prepared. A letter for Customs and Airline Security (on letterhead paper and written by doctor) stating you have diabetes and need to carry needles, lancets, insulin vials and so on with you. It should also state that this equipment and medication must not be taken away from you. If you are wearing an insulin pump, the letter should also include this. Travel and medical insurance documents (make sure you arrange these ahead of time). A card with emergency information (such as "I need sugar quickly") in the language (or languages) of the place you are travelling to. A travel plan for managing insulin adjustments while you are crossing time zones – arrange this with your GP or diabetes nurse specialist. Ask the airline for a flight itinerary that details the length of flights and stopovers plus times of meal service (these may be approximate, only). Travel vaccinations (if you need them) before you travel. Insulin pens (plus spares), pen needles or syringes. Insulin and/or tablets in their original boxes with professional pharmaceutical labels clearly saying what they are. Carry twice as many supplies as you think you will need. A glucagon kit, in its original pharmacy-labelled container. Anti-emetic (anti-vomiting), travel sickness and anti-diarrhoea medication, electrolyte sachets, antibiotics – talk to your GP about what you should take. Carry all your medications in your hand luggage. And check with your airline for up-to-date regulations about carrying medications on board aircraft. Or visit the Aviation Security Service's website (the information on essential medicines is halfway down the page). Blood glucose meter, plus spare batteries. Blood glucose tests strips in the original pharmacy-labelled boxes. Blood ketone test strips (if required). Some countries use mg/dl on their meters. If you need to convert to mmol/l (for example, if you are talking to a health professional in a country that uses this measure), divide the mg/dl by 18. Hypoglycaemia treatment, such as glucose tablets, or jelly beans. Carry this in your hand luggage. Longer-acting carbohydrate snack food in sealed packages, such as muesli bars, dried fruit and nuts, or crackers. Carry this in your hand luggage. But make sure you check what food you are allowed to carry into the countries you are visiting. Fluids. Ask the flight attendants for fluids (diet and sweetened) as soon as you board the flight. There could be a delay in it being delivered. 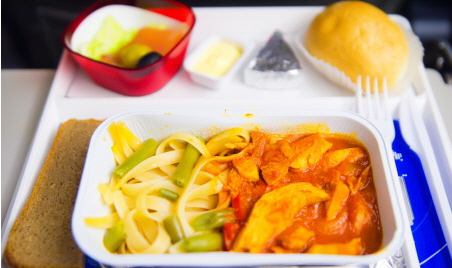 Ask the airline for diabetic meals when booking your flights, but make sure there are enough carbohydrates in each meal or choose healthy options from the standard menu. Take some food options with you in case they can't give you a suitable diabetic meal. A basic first aid kit with plasters, antiseptic and so on. Your medical alert bracelet or pendant. A small travel alarm clock or two watches, if you need to adjust insulin and meal times when changing time zones. 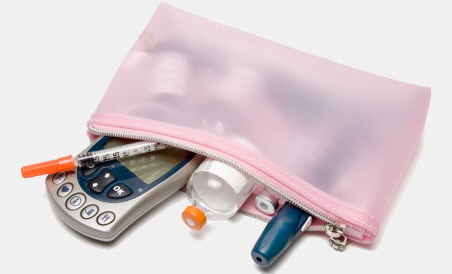 An insulated container or bag to store your insulin, meter and so on. Written by Christchurch Diabetes Centre. Adapted by HealthInfo clinical advisers. Endorsed by clinical director, Diabetes Services, Canterbury DHB. Last reviewed February 2017. Last updated January 2019.